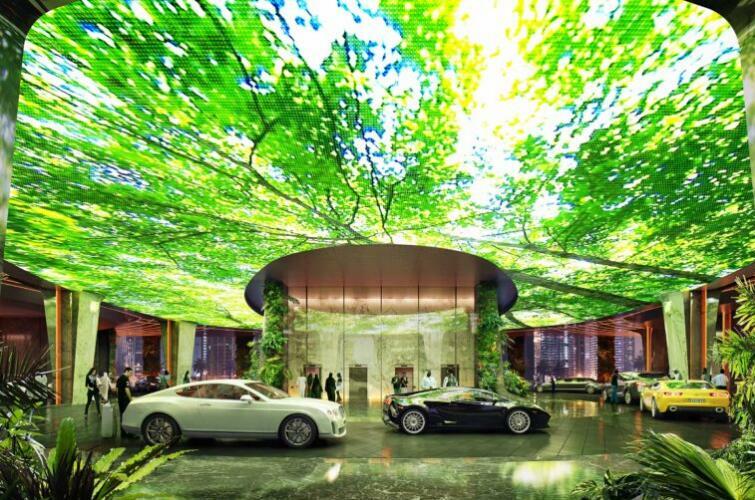 Dubai is getting a new hotel with a major novelty factor: It has its own rainforest. 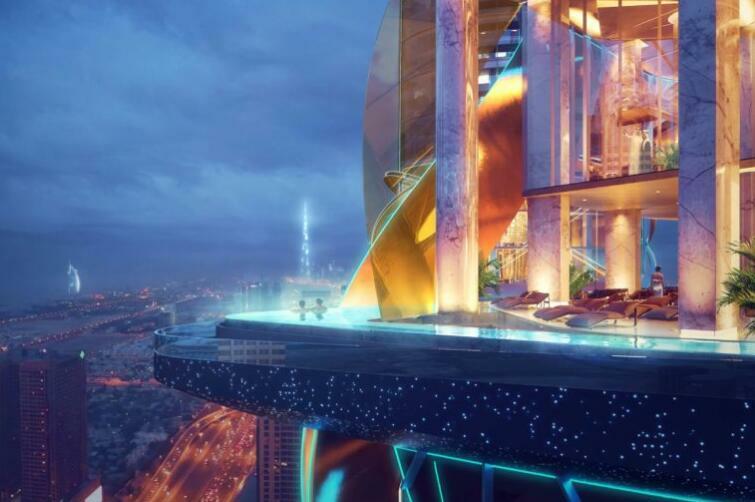 The 53-story Rosemont Hotel & Residences Dubai isn’t slated to open until 2018, but branding design company Plompmozes came up with images of what it could look like. By the looks of it, the hotel will feel like a tropical retreat in the middle of a desert. Even the lobby has a rainforest feel to it. ZAS Architects Dubai designed the hotel, operated by Hilton’s Curio Collection, with LED screens on the lobby’s ceiling. The images change from green rainforests to underwater ocean scenes—complete with sharks—to vast sky scenes. And don’t bother holding on to your suitcase while you gaze up—hand it off to the robotic luggage handling technology. The real treat comes from the outdoor rainforest, which will be on the roof of the podium. Walking the trails surrounded by trees, waterfalls, streams, and marsh, you could almost forget you were in the middle of a 2.8 million-person city. 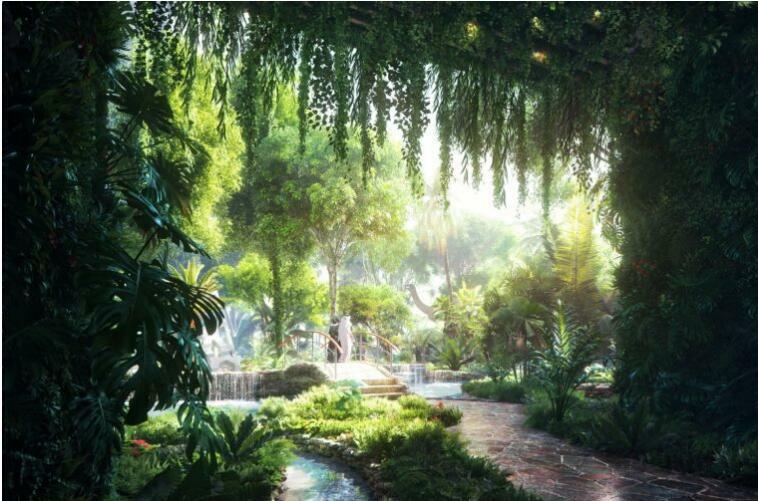 It won’t just look like a jungle—it’ll feel like one too, with a system spraying recycled rainwater to up the humidity. 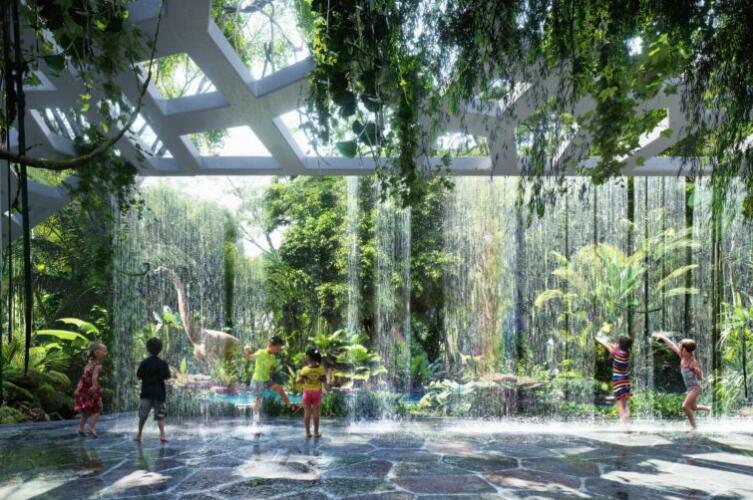 Walking around, you’ll feel that same heavy air you’d get from a rainforest but without getting wet—unless of course, you want to play around in the splash pool, or stick your hand under cascades of water in the rain room. The Rosemont hasn’t commented on the dinosaurs yet, but we’re fairly sure the real hotel will be dino-free. If you’re still nervous, stick with one of these cheap all-inclusive resorts instead. Swimming in the outdoor pool on the 26th floor won’t be your typical rooftop dip. The 30-foot, zero-edge pool has a glass bottom that’s lit from below to look like a starry nighttime sky. Just remember these water safety tips to keep you safe while you swim! Don’t worry if all this sounds a little too outdoorsy for a city visit. The Rosemont will also have laser tag, trampolines, and a bowling alley. Chances are, you’ll still be able to find something to do. No word yet on how much a night at the Rosemont will set you back, but we’re willing to bet the presidential suite won’t be cheap. 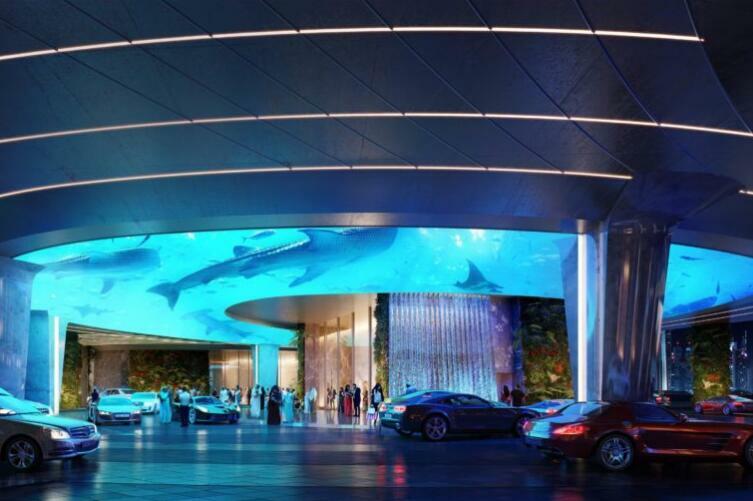 If you’re looking to splurge, though, you’ll be able to treat yourself to the 6,300 square-foot suite’s private aquarium, pool, ice room, wet spa, and more.